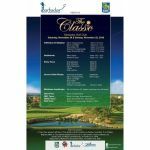 This is the 13th annual RBC Royal Bank Golf Classic, a 36-hole tournament. Seven divisions are being contested over the two days of play at the Barbados Golf Club. Entries close Wed Nov 21st at 6:00 pm. Registration at Barbados Golf Club on Fri, Nov 23rd, 2018 from 11:00am to 6:00pm.